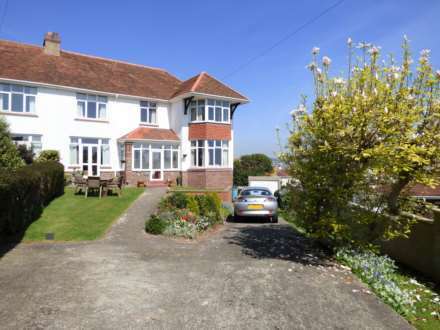 Situated 20 yards from Teignmouth`s delightful promenade and beach. This spacious Ground Floor apartment sits in a desirable level location close to historic French Street. Quality accommodation comprises 2 bedrooms, large double aspect sitting room, separate dining room, kitchen and 2 bathrooms one being ensuite to the master bedroom. The apartment has a 999 yr lease PLUS a share of the freehold, and is offered CHAIN FREE. L`Shaped Hallway. Secure entry intercom system & release. Good ceiling height with decorative cornice and dado rails plus display alcove with cupboards beneath. Two radiators. Large walk in storage cupboard with electric light. Cloaks cupboard with double doors providing hanging and storage space also housing the electric trip switches and RCD unit. This is a lovely light room with high ceilings with cornice, picture rail, and features a recess decorative arch way. The windows to three sides are sash double glazed and provide plentiful natural light plus an outlook over Beach Court to the Promenade, Regent Street and Dawlish Street. This is a lovely room to sit and watch Teignmouth`s town folk go by. TV, telephone and broad band points. Two radiators. This room could equally be used as an additional bedroom or office/hobbies room. Double glazed sash window looking onto Dawlish Street. Radiator. Fitted to three sides is this modern country style kitchen with matching wall and base units. The base units are set beneath quality roll edge work surfaces with decorative tiled splash backs. The units comprise of extensive drawer and cupboard space including pan drawers a double bowl single drainer sink unit. The fridge/freezer, dishwasher and washing machine are integrated. There is a induction touch control hob with extractor hood over plus eye level oven and microwave oven. There is a breakfast bar. The wall mounted units with under lighting comprise of cupboard space plus some display corner units and some glass front units. Wall mounted cupboard housing the gas fired central heating boiler. There is plenty of natural light being provided from high level ceiling windows plus opening sash window to the rear courtyard. TV and Telephone points. Radiator. Fully tiled to floor and walls, shower area with fitted electric shower over, pedestal wash hand basin set in vanity unit and low level WC with concealed cistern. Chrome heated towel ladder. Extractor fan. Double glazed sash window looking onto Dawlish Street. Radiator. Built in wardrobe with hanging and shelving space. Modern white suite comprising of panelled bath with thermostatically controlled shower over. Low level WC and pedestal wash hand basin, Built in storage unit. Over basin mirror and light, plus glass shelving. Chrome heated towel ladder. Tiled walls. Extractor fan. To the rear of Beach Court is a communal courtyard area where the bins etc are stored. We understand the property is held on a 999 year lease dating from 2005 with a 1/7th share of the Beach Court Management Company who own the overall Freehold. The maintenance charge is approximately £1,000 pa to include up keep of the communal areas, including lighting, fire alarm system and cleaning. The exterior of the building has been repainted in November 2018.